Some common things you must know about a computer. Computer is an integral part of everyday life. Computer process the data according to the set of instructions and performs a specific task using its various applications such as Word Processing, Spreadsheet, Database, Graphics, and Web Browsers. Computer has a basic structure that includes various units such as Input, Output, Storage, and Processing Units (or devices) to perform arithmatic and logical operations. 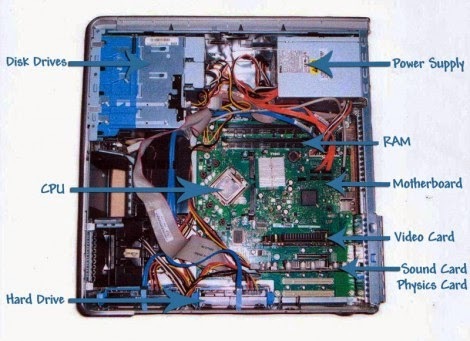 There are several component of a PC (Personal Computer) like Internal Components and External Components. The internal components of a PC are CPU (Central Processing Unit), Motherboard, RAM (Random Access Memory), Storage Devices, and Power Supply to perform various functions. The External Componets are Keyboard, Mouse, Monitor, UPS etc. Computers are classified according to their usage, speed and size.. There are four main types of computers namely Micro Computer, Mini Computer, Mainframe Computer, and Super Computer. 1) Micro Computer : Micro computer is also known as Personal Computer (PC). It is a small machine designed for indivisual users. It is an inexpensive computer that performs tasks such as Word Processing, Desktop Publishinig and Accounting. It is also useful for running spreadsheets and database management application. It is used for entertainment purpose. Example of micro computers are IBM PC Analog I/O Cards, Panel PC etc. 2) Mini Computer : It is a mid sized multiprocessing and Multi-user computer. It is a medium range computer also known as the mid-range server. It is used in business organizations for the mainitenance of accounts and finance data and application. Example- A Opera Mini PC, Fit-PC, MSI-Mini PC etc. 3) Mainframe Computer : It is very large and expensive computers. Thousands of people can use a mainframe at a time. It is used in large companies and government organizations. It can process millions of transactions everyday. Example- IBM System Z10 mainframes. 4) Super Computer : Super computer is the fastest and more expensive type of computer. It is specialize in high-speed processing of data. A major disadvantage of super computers is that they generate large amount of heat during their operation. It is used for weather forecasting, nuclear research etc. Example - Cary Jaguar, IBM Roadrunner. The basic structure of a computer includes various units such as input, output, storage and processing device to perform airthmetic and logical operations. 1) Input Devices : Computer needs input to perform a particular task. Input devices sends data and set of instructions to the computer. The input devices are keyboard, Mouse, Scanner etc. 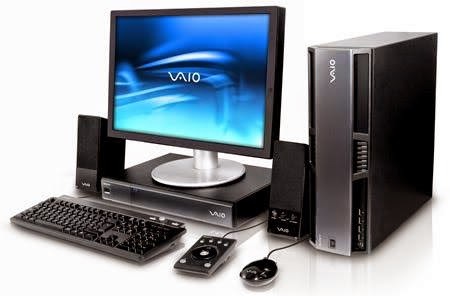 2) Output Devices : The device that is used to display or produce the output is known as output devices. Its function is to send the processed results to the outside world. The output devices are monitor, printer etc. 3) Storage Devices : Storage devices store data in the computer. Advanced storage devices store several gigabyte of data. The storage devices are floppy disks, pendrives, hard disks etc. 4) Processing Devices : The main function of the computer is to process data. The processing device of computer is the processor, commonly known as CPU. The processor consists of two unit, Arithmatic and Logic Unit (ALU) and Control Unit (CU). ALU performs arithmatic and logic operations such as addition, multiplication, division, comparision of the numbers. CU transmits the control signals to other devices. The internal components of a personal computer are CPU, motherboard, RAM, storage devices and power supply to perform various functions. CPU has two units ALU and CU. ALU performs all the arithmatic and logical operations and CU cordinate all work of other units. 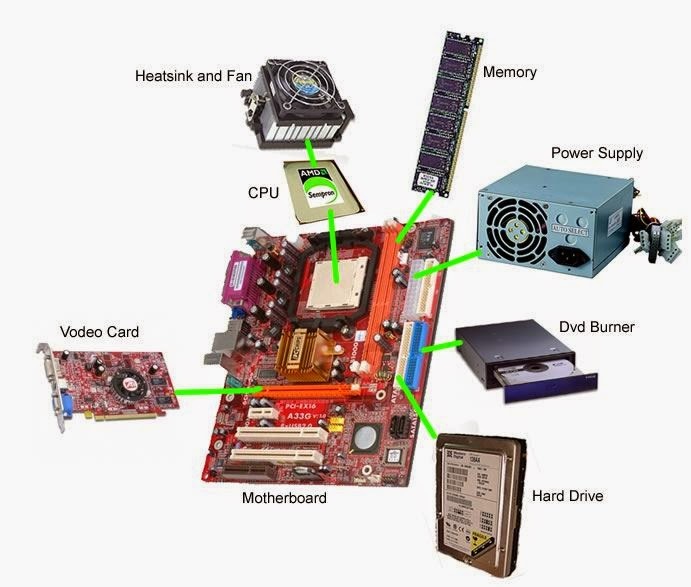 Motherboard is the main circuit board of a PC. It has a chipset to perform all the operation of the system. All the other parts are connected to the motherboard by mean of socket, slots and connectors. RAM (Random Access Memory) is a volatile memory. Its stores data temporarily. Once the system turns off, it loses the data. Storage Devices have long tem memory such as hard disk. It stores data permanently. Storage devices are hard disk, floppy, pendrives etc. Power Supply converts the AC current to the DC current. It supplies power to the different system components such as motherboard and the device drives. It is available in the range of 250W to 600W. Computer is a very large thing to know. We are trying to give you a proper knowledege about computer. We will discuss more in our next post. I am VK now signing off. Thank You.